This is the story of a bean. My parents have grown the Green-seeded Tender-Green bean for many years. They don’t remember where or when they first got the pale green seeds. Tender-Green is an amazing green bean! It is a bush bean that produces large, juicy, stringless, very tender green beans over a long season. Even when the beans are as big as my finger, and you’d expect them to be tough or stringy, they are still delicious. This bean also flourishes in containers and is well-suited to growing in a Biodome Greenhouse. My parents saved the seed each year. We always enjoyed huge feeds of these beans and I pickled them as well during the height of harvest season. Then one year, my father said that there wouldn’t be any Tender-Green to eat because all the beans had to be saved for seed (as well as the next year’s planting, my parents wholesale this fabulous seed to Saltspring Island Seeds). So we ordered some Tender-Green bean seeds from some other seed company and planted them. They weren’t the same! Relatively tender bush beans, yes, but with brown seeds when dry and more flattened pods that weren’t quite so tender when they were a bit over-mature. We all agreed that the old Green-seeded Tender-Green was the best. Then the next year brought bean disaster. The first crop of Tender-Green beans were apparently planted too early and rotted. The next planting was completely eaten by deer when they got into the garden. There was no seed left. None. My parents called Dan Jason of Saltspring Seeds and asked if he or any of his regular customers had Tender-Green beans that they could save for seed before the end of the season. No luck. And just like that, the best bush green bean I’ve ever tasted was gone. This can happen so easily, to any seed. If we are not careful to treasure and propagate the seeds we value, they can easily be destroyed or lost. A few crop failures or other circumstances can mean that your favorite old standby plant seed is suddenly extinct. Seeds cannot be stored forever, however. Storing seeds in the fridge or freezer, in a tightly sealed container to keep them dry, can extend the viable life-span for seeds, but some types of seed lose viability quickly. When saving seeds, it is equally important to continue to grow the plants and save fresh seed on a regular basis. Always label your seed containers with the species, variety and date. Whole books have been written on seed-saving. Here are a few basics. Start with good quality, vigorous plants that are themselves “open-pollinated” rather than “hybrid” (sometimes denoted with “F1” or “F2”). Many heritage varieties are open-pollinated. Make sure that your crops do not cross pollinate with other varieties, either in your own garden or in your neighbors’ gardens. Be aware that different types of plants require more or less distance from other varieties. Beans, for example, do not cross-pollinate readily, while corn needs a large separation from other varieties of corn. To ensure long-term vigor and sufficient genetic diversity of seeds, you need to save patches of twenty or more plants of a given variety. Remember to label the patch and mark it for seed-saving. Keep checking on ripening seed plants and harvest when the maximum amount of seeds is ripe. 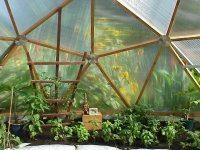 Most seeds can be dried on racks or in large paper bags in the upper area of your Biodome, or in a similar warm, well-ventilated space. Or you can pull up the whole plants and hang them to dry. When the seeds are completely dry, use a water-proof marker to label them with the variety and date, and then store them in a cool dry place. Many places have late winter or early spring “Seedy Saturday” seed swaps, where people bring their own seeds and exchange with other growers. This is a great way to find out about new crops that will grow well in your area and to share your favorites with your neighbors. Seeds also make excellent gifts. Back to the Tender-Green bean saga: not long after we had resigned ourselves to the fact that our favorite green bean was gone forever, my father discovered some overgrown bush beans in a distant garden patch. He had planted them in the late spring, watered them once or twice to get them going and then, being overwhelmed with other obligations, had totally neglected them. The beans had grown anyway and were covered with drying pods. He opened one, expecting it to be the brown-seeded variety of Tender-Green. Instead he found our unique pale green beans! He harvested them immediately and brought them back to the dome for drying and shelling. For now, we continue to enjoy our favorite bean. And we’re careful each year to never plant ALL the seed, in case of crop failure. For whatever reason, you may find some year that one of your favorite vegetable varieties is simply not available from the seed companies. If it was a hybrid variety, you’re out of luck. But if it was an old-fashioned open-pollinated variety and you have been saving seed each year, you are no longer dependent on the whims of the seed market or some other company’s taste for vegetable varieties. 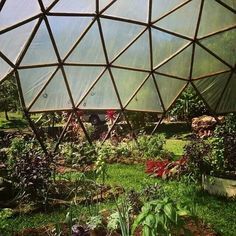 Save your seed, save your money, and grow vegetables that are ideally suited to your bio-region and your geodesic greenhouse. This entry was posted in Biodome Gardening. Bookmark the permalink.